Tuesday, July 24, 2018 ~ 3:00 p.m. Endless Journey Hospice or Saline Ford Historic Preservation Society. Barbara A. (Lewis) Ziegenbein, 89 of Ashland, NE passed away Friday, July 20, 2018 at the Ashland Care Center in Ashland, NE. She was born August 1, 1928 in Missouri Valley, Iowa to Drexel and Verona (Ruberg) Lewis. Barbara graduated from Ashland-Greenwood High School, attended the University of Nebraska in Lincoln and later became a qualified music instructor from Suzuki Talent Education School. 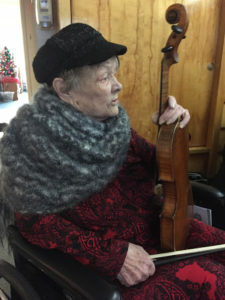 She taught private violin lessons most of her life. In 1978 she founded the Ashland Arts Council and in 1995 she was a founder of the Saline Ford Historic Preservation Society in Ashland. She was a member of O.E.S. Matthews Chapter #242. She played in the Omaha and Lincoln Symphonies for many years. Barbara was a loving mother, grandmother and great-grandmother. Besides her family, she loved music and passed her love of music down to all her children and their families. She is survived by her children, Judy (Butch Kenney) Reid of Lincoln, Jennifer Lynn (Rusty) Ziegenbein-Welch of Colorado Springs, CO, Keith James (Ardith) Ziegenbein of Ashland, Kevin Lewis (Mary) Ziegenbein of Ashland; grandchildren, Brian Reid, Aaron (Lori) Reid, Anna Lynn Haney, Zak (Jenny) Ziegenbein, Zebadiah Wilson (Amanda) Ziegenbein, Amy (Adam) Anderson, Alex (Ashley) Ziegenbein, Austin (MariBeth) Ziegenbein; 15 great-grandchildren and one great-great-granddaughter; sister-in-law, Luella Lewis; brother-in-law, Robert Berkley. She was preceded in death by her parents, Drexel and Verona Lewis, infant daughter, siblings, Carl Lewis, Jacqueline Berkley, Alan Lewis. My heart is broken to hear the loss of Barb Ziegenbein. She was my favorite resident at the Ashland Care Center when I worked in dietary aid in the kitchen. I use to spend my breaks or lunch breaks visiting her. We formed a really good friendship. I enjoyed her company so much I sometimes visited her on my days off and after i ended my employment at Ashland Care Center I still made time to go visit and chat with her. I am so sorry to read of Barbara’s passing. She was such a pleasant lady who always seemed interested in what a teenager had to say (back when Jenny and I were in high school). I also remember her playing the violin and impressed with how talented she was. My sympathies to Jenny, Judy, Keith, Kevin and families. My mother Carol Ziegenbein Patocka and I Karen Patocka Johnson send our condolences to the Ziegenbein Family. So sorry for your loss. My mother Carol is related to the Ziegenbein family. Please let them know we’re sirry this is late.